You might not like tattoos, but that might change if you have diabetes (type 1 or type 2) and know that there is a tattoo that can help you control your blood sugar. Yes, such a thing really exists. You see, this isn’t like the conventional tattoos, these tattoos can save many lives. They change color in order to tell when the blood glucose is low or high. This tattoo may be terrific for those who have diabetes since drops and spikes in blood glucose are common traits and they might impact the individual severely in case no action is taken in time. 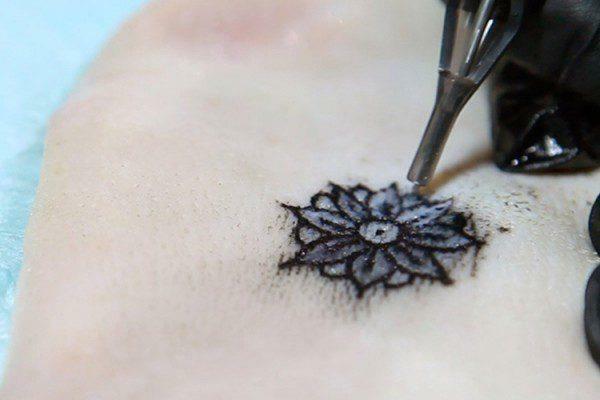 This new tattoo for diabetes is known by the name biosensing tattoo. You should know that it’s created by scientists with the potential to change the quality of life for those people who have diabetes and deal with it every single day. The way this tattoo for diabetes helps people with their blood glucose is special, what it does is that it changes its color. This tattoo for diabetes occurred thanks to the combined research by scholars from Harvard and MIT. They called this project Dermal Abyss. You should know that the tattoo has color changing bio-sensors. These sensors are programmed to act to changes in the interstitial fluid present in surrounding tissue cells in human bodies. This tattoo for diabetes is actually a combination of biotechnology and tattooing. The team says that this tattoo is a combination of advanced biotechnology and tattoo artistry. The issue is that today people who have diabetes are only able to monitor their blood sugar by having to prick their fingers 3 times on a daily basis. For some people, this is a painful process. But this tattoo might help change that conventional procedure. Instead of piercing their fingers, people who have diabetes might refer to the changes of color of the tattoo that monitors their blood glucose levels by converting from purple to pink of vise versa and the need for insulin. This is a great breakthrough for medical technology where many people might benefit from it the second it becomes commercial. The research is focused on 4 kinds of biosensors which can react with the biochemical data present in the interstitial fluid. Based on the glucose levels, the pH of the fluid or the acidity shall change to either pink or purple. The glucose sensors change between blue and brown and the sodium sensor along with another one will fluoresce at bigger intensity under UV light. You should know that the primary tests for this tattoo were done on pigskin. There a couple of injections had to be administered in order to understand the visibility and function of the biosensors completely. Currently, the new medical biotechnology is in the research phase, and the clinical trials aren’t planned. At the moment there are no plans to make this tattoo a product.